Once again, Santa Margherita Pinot Grigio has snagged the number one spot as the top selling luxury wine brand in the United States. In the latest report by Wines Vines Analytics, Santa Margherita Pinot Grigio smoked the competition among wines that are priced at $20 per bottle or more. Sales for Santa Margherita Pinot Grigio topped $36.5 million, nearly double that of Decoy, the #2 wine brand made by Duckhorn. California’s giant Central Coast region only registered a single luxury top seller with Justin (at #8). All the other 18 brands were from Napa or Sonoma counties. The wine sales figures tracked the 12 months prior to June 1, 2014 and represented off-premise sales, that is, sales of wine that are not meant to be consumed on-site, such as purchases made at grocery and retail outlets, including wine shops. Restaurant and bar sales were not included. The story of Santa Margherita’s success is itself remarkable. Virtually unknown to American consumers until 1979, the stateside success of Pinot Grigio in general – and Santa Margherita in particular – has been ascribed to one man, the maverick wine importer and vintner, Anthony (Tony) Terlato. On a trip to Italy to discover the next great thing in wine, Terlato tasted a Pinot Grigio in a Milan hotel that rang his bell. Terlato did his homework, ditched his other plans and drove to Alto Adige, the country’s premier winegrowing region for Pinot Grigio. There, in Italy’s northernmost wine region at the southern border of Austria, as he dined alone in a Portoguaro restaurant, Terlato ordered all 18 Pinot Grigios on the wine list. Terlato was soon joined by the restaurant’s proprietor and together, the two men tasted through the 18 wines and considered how they paired with different foods. The winner: Santa Margherita. The first vintage to hit American shores and stores was the 1979. By 1999, 530,000 cases of Pinot Grigio/Gris were sold in US supermarkets alone, which grew to nearly three-quarters of a million cases by the next year, a 40% increase. By 2009, Santa Margherita Pinot Grigio had been voted the top imported wine of any color in fine restaurants for the 14th year in a row by Wines & Vines. The secret to the enduring success of Santa Margherita might have seemed obvious to Tony Terlato at first sip in Portoguaro. As with Santa Margherita’s version, a well-made Pinot Grigio is light on its feet, refreshing, and food-friendly. Good Pinot Grigio has delicate aromatics and bright acidity, delivering clean, minerality and fruity flavors on the palate that can range from crisp golden apple to citrus, stone and more delicate tropical fruits. Some versions offer a taste of honey, herbs, quince or pear. The best are energetic and happy wines, never brooding or boring. Both versions of Santa Margherita Pinot Grigio are raised in stainless steel to preserve freshness. The Santa Margherita Alto Adige is more perfumed and complex with delicate spice notes. As might be suspected, the Alto Adige bottling is pricier than the more widely distributed Valdadige (available for about $16 at Costco and Total Wine, among others). Both are highly recommended. If you find yourself pining for Pinot Grigio as your go-to wine, you’re in luck. 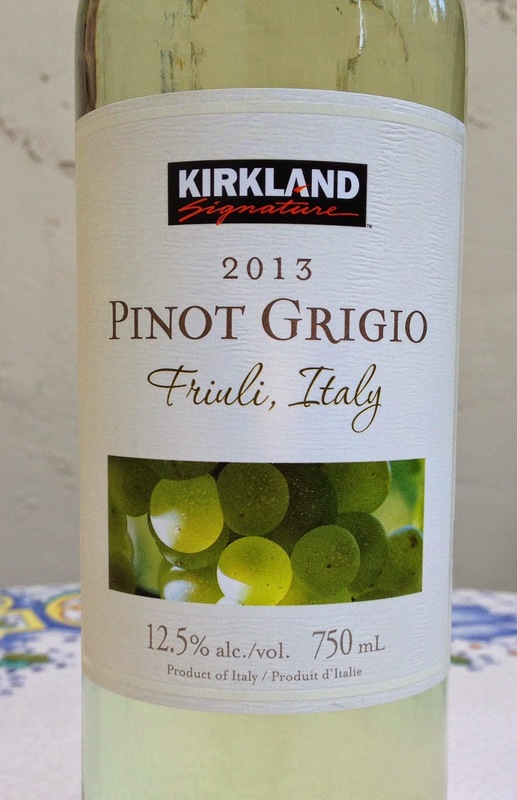 Costco's Kirkland Signature 2013 Pinot Grigio from Italy’s northeasternmost Friuli region is a lip-smacking quaffer. For about $7, you can enjoy this refreshing, minerally white with tasty citrus and peach flavors – and it’s a screwcap. Even better, it clocks in at only 12.5% alcohol. Now that's amore. Summer is the perfect time to explore Italian Pinot Grigio. Like other Italian wines – and Italian white wines in particular – Italian Pinot Grigio goes swimmingly with food. Shellfish and other lighter fish and fish dishes are natural partners, as are salads, vegetables, rice, pasta and most lighter dishes that can be brightened by a squirt of lemon. Think pasta frutta di mare, halibut, seafood risotto, calamari or sushi. Sara Moulton shares a great recipe for creamy clam open ravioli to go with Santa Margherita’s Pinot Grigio. In another post, we’ll look at Pinot Gris from Oregon, Alsace and other winegrowing regions. Like Syrah/Shiraz, Pinot Gris represents the same grape variety as Pinot Grigio but oh, what a difference the terroir makes. Let us know about any Pinot Grigios you’ve enjoyed lately in the comments.